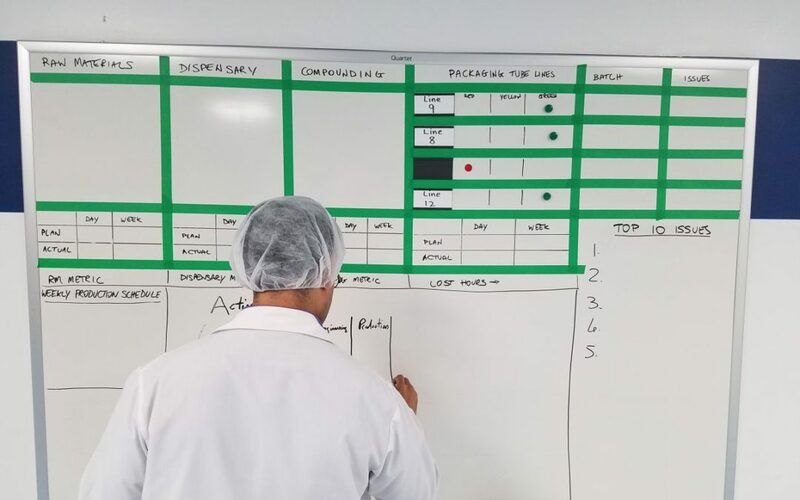 Pen-Operated White Boards in times of Digitalization? “Really a board?” – we hear many of our clients ask. “Why not a screen bringing online data to the shopfloor?” … This would be “no effort” as data is directly taken from the system and it brings the spirit of digitalization, doesn’t it… ? A quick deep-dive reminder into the purpose of our boards brings us already close to the answer. help the people of the process to better understand their performance – and what it takes to improve it. bring ownership and purpose to the process people. Every time a load of work has been done, they carry “this” as a number to their board. And put it there. It’s their number and they’ll also take it home in their memory. These numbers tell them in the end of their working day, what to be proud about and what to do better. trigger right decisions and drive actions. help to focus on what matters most. … and break down site targets to every operator. The only thing you see on the board are gigantic PSQDCs each featuring 31 circles colored in red or green but there are no actions derived. Certain metrics are always green. It’s hard to tell, what these numbers want to tell us… What is relevant for this working space? Is today’s output/ quality good or bad or good enough? And, if the output of this line is to be one ton per month: Would it be sufficient to produce one bag per hour? How can you spot the good ones? Those, which really drive performance? process people fighting to make their numbers, they have hundreds of ideas on how to become better. At first glance you see all these efforts “under construction” on the board as well as many actions which have recently been completed. Metrics and indicators change as also priorities change. Becoming better and better, at some point it’s necessary to focus on the next restriction. This board manages interaction with other departments. Many problems can’t be solved with just the people from this process. which helps to take the right decisions, here. Exactly the required information can be quickly and for very short time intervals displayed at this line? Trend data will be made available? Online display of overall performance or other department’s performance is relevant for the process here? The effort and the time to change the required IT systems to the next relevant indicator is justified by the more fancy look-and-feel or by saving efforts at the line? Conclusion: Already to decide on the level of reasonable digitalization a quite high level of maturity is needed. It makes sense to challenge the approach! How often are people requesting a system to solve problems and to improve. No work is done until paper work is done. And so is process improvement. Make it paperbased and whiteboard hand written until it works, then digitize it. Thanks for the comment, Klaus, absolutely agree!